This page is intended to be a developer guide for Funtoo Linux. Please see Local Development Setup for a definitive guide on kit internals and how to set up a local Funtoo Linux development environment. Local_Overlay -- take the crash course of setting up a local overlay, revision bumping a package, testing, and syncing to github. Git_local_overlay -- drobbins' local overlay guide, less of a crash course, better permissions, and better suited for large overlays. Portage Variables -- learn about all those variables inside an ebuild, and in make.conf. Forking An Ebuild -- explains how to take an ebuild from Gentoo and fork it, so you can make local changes. Ebuild Functions -- src_unpack, src_compile -- these are ebuild functions. There are others. See all of them and learn how they work. Multiple ABI Support -- learn how the gcc wrapper and multilib.eclass work in Gentoo and Funtoo. Portage (Funtoo) -- learn about Funtoo changes to Portage (needs updating). Portage Dynamic Slot - dynamic SLOT functionality now in Portage. Metro Quick Start Tutorial -- learn how to use Metro, our automated build tool. Metro - a full index of Metro-related documentation. 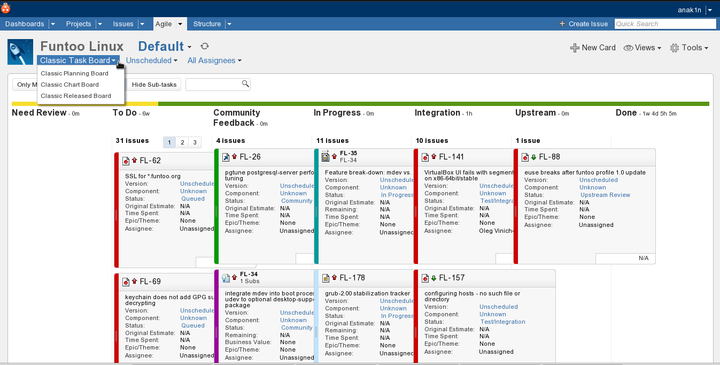 Learning how to help squash out bugs can be a difficult thing to do, especially since sometimes JIRA looks a little overwhelming and confusing. A thank you to Daniel for making some videos (see below) on explaining this better, but there were a couple things left out. So I will take you through that. (With picture reference). The first thing you're going to want to do is make an account, which is simple as clicking on the 'Log in' button on the top right, then clicking 'Sign up'. After you've made your account, the best way to watch bugs is to click on the 'Agile' drop-down menu, and choose 'Classic'. Now, we're going to want to change a couple things even with this. 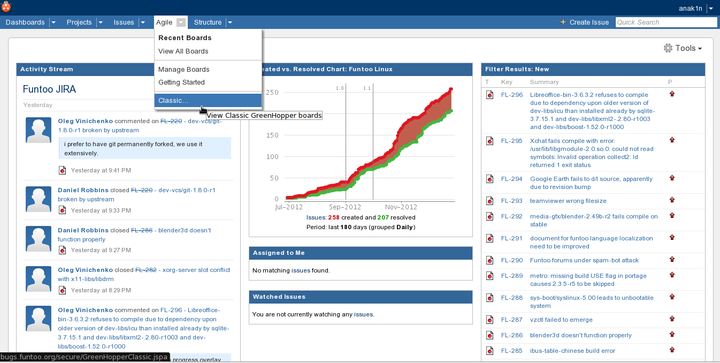 By default, the 'Classic' mode takes you to 'Classic Planning Board', you want to change this to 'Classic Task Board'. This makes things much easier to read. I also recommend going to the Views eyeball icon to the right and selecting the List issue view, and the Compact (Kanban) task board mode. 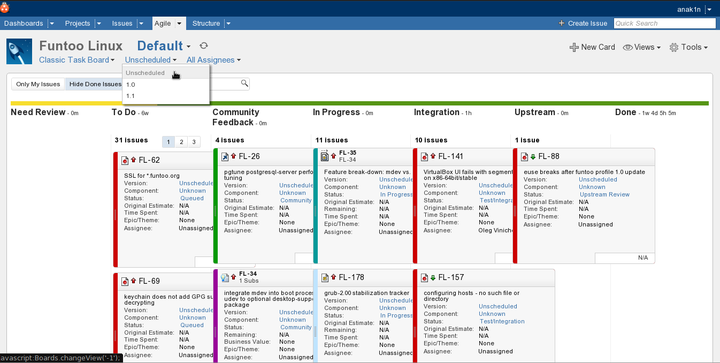 This will give you a top-level overview of all our bugs and their statuses, and JIRA will remember your view preferences the next time you log in. After that, we're almost ready to rock and roll. We need to also make sure that you're not set to any version or we'll only see a few bugs. So in case it says '1.1' or '1.0' change it to 'Unscheduled'. And after all that, you can view and look at bugs that are in queue, To-do, or testing, which Daniel's videos are very great at explaining. Thanks for helping Funtoo Linux better and better.